Angelonia cultivars are fabulous sun-loving beauties! These are sun-loving and attractive beauties that come in all sorts of fabulous and tempting colours. The gorgeous bicolour ones such ‘Blue Pacifica’ in two-toned blooms of pale purple and white, and the ‘Purple Stripe’ in dark purple and white are a sight to behold! We first saw these beauties in November 2013, but had to restrain ourselves from buying because we wanted to limit our garden collection due to failing health. However, we noticed late last year that our outer border was begging to be adorned with replacement plants as there were some casualties even with our tender-loving-care. 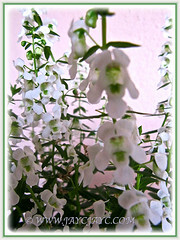 Hence, we went plant shopping happily last December and ended up buying two pots of Angelonia, one containing the white-coloured beauty, Angelonia augustifolia ‘Angelface Alba’, while the other is ‘Angelmist Lavender’. We’re absolutely thrilled with our purchase as these were simply excellent for our outer bed that receive sunshine almost all day long to provide the essential heat and warmth. 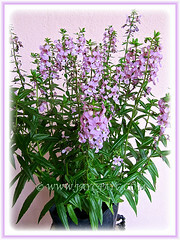 Botanical Name: Angelonia (followed by the name of species and ‘cultivar’). 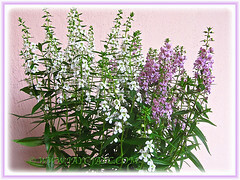 Common Name: Angelonia, Summer Snapdragon, Narrowleaf Angelon, Angel Flower, Summer Orchid. 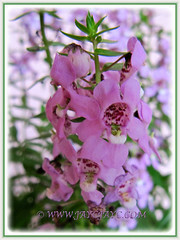 Etymology: The genus name, Angelonia is derived from Angelo, the plant’s vernacular name in its native range. The species epithet angustifolia means narrow leaf, referring to the plant’s foliage. Origin: Native to Mexico and the West Indies. 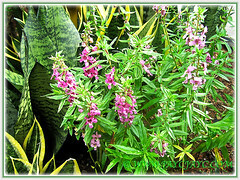 Features: Angelonia is a genus of about 30 species or so of herbaceous flowering plants that are everblooming, especially in tropics with everlasting summers and frost-free regions. An evergreen low-growing bushy perennial that can reach 30.5 to 61 cm tall with a spread of about 30.5 cm. The plants are usually upright-growing with soft smooth stems and clothed with narrow and oblong 5 to 7.6 cm glossy green leaves that have pointed tips and serrated edges. Foliage is known to be slightly scented. The stems are adorned with eye-catching snapdragon-like flowers that bloom over a long period in summer, hence called ‘Summer Snapdragon’ as one of its common name. The Angelonia flowers show off their beautiful coloration in various hues of purple, white, pink and even two-toned, depending on the cultivar. The two-lipped blooms that are less than 2.54 cm wide and borne in 20 cm long terminal spikes will gradually open over several weeks. 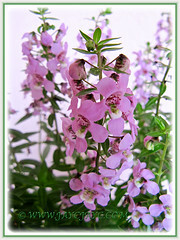 The garden varieties are mostly cultivars of the species, Angelonia angustifolia. The popular patented cultivars, ‘Angelmist’ series (comes in 6 colours from deep plum to lavender) and ‘Angelface’ (vibrant multi-colours) are vigorous growers. Flowers of angelonia are greatly specialised with regards to the pollination as they have hairs in the inner corolla, which produce oils collected by the oil bee pollinators. 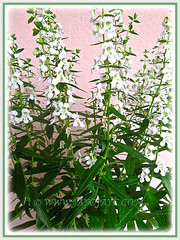 Culture (Care): Angelonia grows easily with the least maintenance. Light: Full sun and high humidity. Moisture: Water regularly for optimum growth. Once established, it’s moderately drought tolerant. Soil: Grow in moist, well-drained and fertile loamy soils. Others: Since Angelonia looks excellent with erect flower spikes, do cut back any stem that slant downwards or threaten to fall and withered/shrivelled ones. Do not be afraid to shear plants back 50% to extend the bloom and rejuvenate plant vigor. They do tolerate hard pruning well and will return with flowers in about 2-3 weeks. Feed once monthly and lightly with a balanced organic fertiliser, one that provides healthy growth and flower production. Generally free from serious garden pests, though do watch out for aphids and powdery mildew. For subtropical and temperate regions: Hardiness: USDA Zone 9-11. 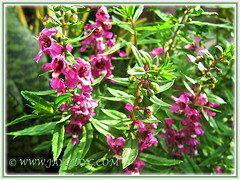 Angelonia is a tough perennial in the above-mentioned zones but an annual elsewhere that has to be grown in containers and brought indoors during cold weather. If indoors, e.g..grown in a glasshouse that is brightly lighted with sufficient warmth and sunshine, it’ll continue blooming through the winter. Best to propagate by sowing seeds, from cuttings or root mass division in spring. 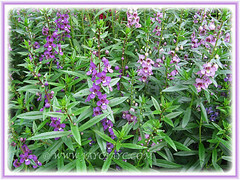 Angelonia has been listed as a deer resistant plant. 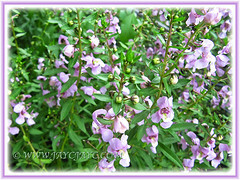 Propagation: By seed, tip cuttings or division of the root mass, the latter two methods being the easiest…..
Usage: Angelonia cultivars, with their short stature, colourful flowers and long blooming period, will be a knock-out in any landscape. These ornamental plants are perfect in container planting, above-ground planter and window boxes, especially if massed with differently coloured Angelonia. Excellent too as edging in front of perennial borders and beds to add vibrant colours to hot and sunny areas in your garden. Also, great as cut flowers. I love these too. Very nice dependable wet season flowers that dont look tropical at all. They almost look like they should be in an English cottage garden. Not exactly flashy and from a distance you cant see them at all, just a slight haze of colour, so also a nice surprise in a garden or for close up. My favorites are the dark dark purple, or is it blue I can never decide and the paler blue or is it purple? Blue is such a rare colour in the tropics/sub tropics maybe I’ve just convinced myself its blue and not purple, works ths same for me anyway as its one the cool spectrum of purple anyway. For such a delicate cottagy thing it is mighty tough, though. I just love the way it happily stands up to the extremely heavy pounding tropical showers, typhoons, dry season, everything. One breath of our tropical humidity and heat would flatten anything similaer from a more temporate climate Im very sure. Its also quite a long lived perenial. I wait untill it is showing signs of growth again in the wet season before going around and chopping all the tangled last years happening off, about three inches from the ground. Its very rewarding as it bounces back with a nice neat compact new plant almost without fail. I have killed a few by over watering in the cool dry season which they don’t seem to much like here. Chopping them back in that season also doesnt do anything but seems to rather weaken their chances for the growing season. Jacqueline we dont get many varieties here so Im looking forward to the two toned ones eventualy appearing. A nice dark purple “giant” has appeared though, bigger flowers stronger higher stems, I would like that in white too if it exists. I hope your health is picking up meantime. I love reading this blog. I only discovered it recently. 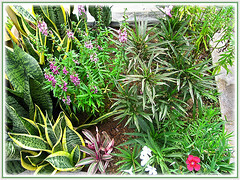 There is so little current info for tropical gardening, it’s a breath of fresh air. Thanks. I can’t wait for you to discover Curcurma alismatifolia and their varieties and hybrids, if you haven’t already of course! Im still reading through all the entries. We’re also looking out for the bi-color ones to add to our garden collection. Much thanks for good health wishes… I appreciate that. Currently, still undergoing chemo but tolerating well with God’s grace and mercy. Thanks for the thumbs up… we love sharing our tropical garden beauties!